Thirty-three photos hang framed on five walls. All black and white, all Moscow, all quite thought-provoking in their own way. Ela Kinowska’s style is candid photography, and the subject matter, the city of Moscow, lends itself naturally to the genre; scenes of Moscow life tend to be candid indeed, even matter-of-fact in their beauty. This has not escaped Kinowska’s lens. 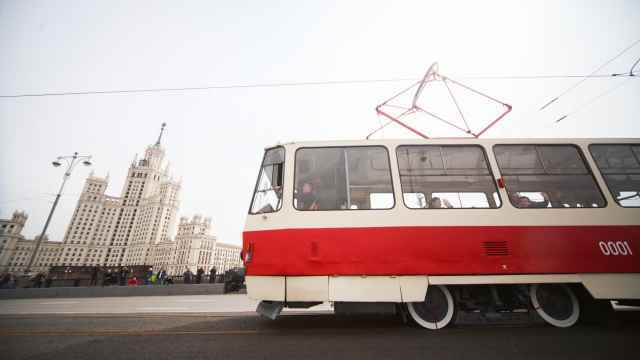 “Moscow is a multilayered city, where a surprise is waiting for your around each corner, it is unpredictable and full of paradoxes,” Kinowska said. The photo “Love & Care” illustrates how Kinowska has captured Moscow’s fleeting moments, showing a stone statue of two embracing lovers with somebody’s autumn coat hanging cosily atop one of them. In “Rostropovich Uncovered,” another picture of a sculpture is brought to life though a snapshot of its unveiling ceremony that captures the athletic pose of a worker straddling the sculpture, adjusting the ceremonial covering veil. The worker’s glutes are as aesthetic as the bronze and granite statue itself, making a primary art form out of what would otherwise be secondary-source art — a photo of a sculpture, after all. The photograph of President Vladimir Putin in attendance at the Rostropovich unveiling ceremony was omitted from the exhibition, a touch that reminds you of the objectivity of Kinowska’s candid photography; the pictures are just of people doing things in their city, there is no room for a political or celebrity angle to distort this. After 15 minutes of room-shuffling, taking in the images one by one, you should be left with a feeling that this is an accurate rendering of Moscow and all its contradictions: classic/modern, happy/sad, rich/poor, and candid through-and-through. Kinowska is a Polish-born Canadian photographer who spends extensive stretches of time in Russia and large proportions of that time outdoors taking photographs. “Being Young” is a delightful example of Kinowska’s outdoor photography. It shows a girl in a white knitted skirt-jumper, winter hat and form-fitting tights running up a hill of snow in an athletic pose that you might expect to see from a Sochi competitor, except this is pure leisure. “A Passer-By” echoes the above: Another young lady in white caught in motion as she moves through a crowd with her ice-skates swinging on her shoulder. Also caught in motion in this particular snap is the guy checking her out. Representing the other ends of the age spectrum, “A Sunday Still” shows the common sight of a baby in a stroller being pushed by its dutiful babushka. And returning to urban Moscow, Kinowska’s “A Reader” is a metro scene of a lady reading a book mid-commute, capturing the Moscow metro and its well-dressed, well-read, citizenry. 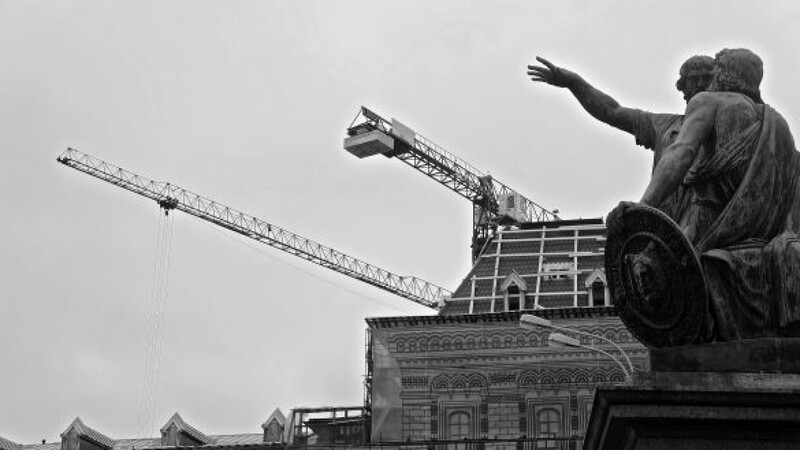 Back above ground, “This Way to the Kremlin (History in Construction)” captures cranes and classic sculpture with well-balanced composition and a great mythic shot angle. Images like the latter — a skyline full of cranes — go a long way to capture hope for the future and urban progress as themes in this work — if you are to believe the rule of thumb that a horizon full of active cranes is a rough but good general barometer of a city’s economic prowess, or at least, progress. The exhibit will give you an added appreciation for Moscow if you already have local knowledge. If you are unacquainted with the city, the images serve as a candid portrayal of Moscow and a quasi-advertisement for it. Making time to check out a photo exhibit is generally a good idea anyway these days, because setting aside time for enjoying the art of images is a welcome, guilt-free break from the often procrastinatory mode of photo consumption in 2013: online, short-on-time, and not curated. Moscoviana runs until Sept. 26 at the State Library for Foreign Literature, 1 Nikoloyamskaya Ulitsa. Admission is free. 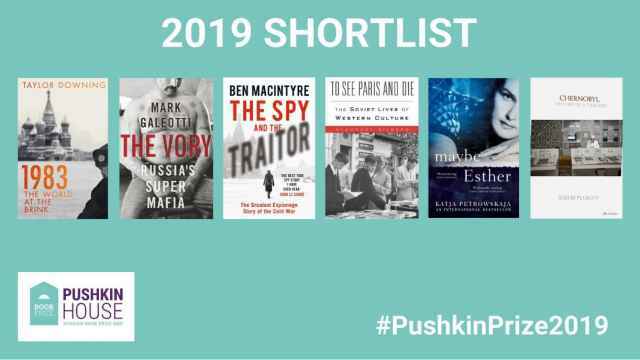 Pushkin House has announced their short list of the best non-fiction about Russia published last year. 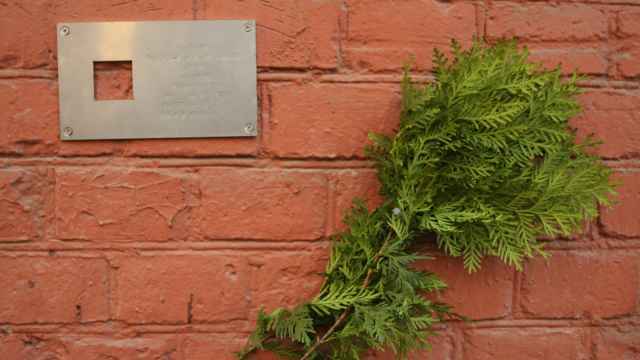 On Sunday a plaque went up on the apartment house that was the Last Address of a great avant-garde painter. Nabokov had a lasting influence on generations of writers all around the world.